Only ONE Registered Keeper from New, Just Serviced, Fully PDI Checked, 3 Stamp FULL Service History, LOW Road Tax Band, Next MOT Not Due Till April 2020 & Done Only 55,000 Miles. Spec Level Includes 360 BIRDS EYE View Cameras (inc Reverse Camera), Touch Screen SAT NAV, Bluetooth Stereo with Audio Streaming, KEYLESS Entry/Ignition, Full Glass PANORAMIC Roof, Heated LEATHER Seats, Parking Sensors, Privacy Glass, Diamond Cut Alloy Wheels, Auto Headlights, Auto Window Wipers, Folding Electric Wing Mirrors, Electronic Handbrake, Lane Assistance, 6 Speed Gearbox, Cruise Control, climate Control, AC, Both Heated Windscreens & Multi Functional Steering Wheel Controls. Only ONE Registered Keeper from New, Just Serviced, Fully PDI Checked, FREE Road Tax Band, Next MOT Not Due Till April 2020 & Done Only 25,000 Miles. Spec Level Is FULLY LOADED With The Glass Panoramic Roof, 360 BIRDS EYE View Cameras (inc Reverse Camera), Touch Screen SAT NAV, Privacy Glass, Diamond Cut Alloys, Folding Electric Wing Mirrors with Built in Indicators, Electronic Handbrake, Auto Headlights, Auto Window Wipers, KEYLESS Entry & Ignition, 6 Speed Gearbox, Cruise Control, Climate Control, AC, Both Heated Windscreens & Multi Functional Steering Wheel Controls. Only ONE Owner Direct from New, Just Serviced, Fully PDI Checked, FREE Road Tax Band, Next MOT Not Due Till January 2020 & Done 33,000 Miles. Spec Level Includes 360 BIRDS EYE View Cameras (inc Reverse Camera), Touch Screen SAT NAV, Bluetooth Stereo with Audio Streaming, KEYLESS Entry/Ignition, Heated LEATHER Seats, Parking Sensors, Privacy Glass, Diamond Cut Alloy Wheels, Auto Headlights, Auto Window Wipers, Folding Electric Wing Mirrors, Electronic Handbrake, Lane Assistance, 6 Speed Gearbox, Cruise Control, climate Control, AC, Both Heated Windscreens & Multi Functional Steering Wheel Controls. Only ONE Registered Keeper from New, Just Serviced, Fully PDI Checked, LOW Road Tax Band, Next MOT Not Due Till March 2020 & Done 24,000 Miles. 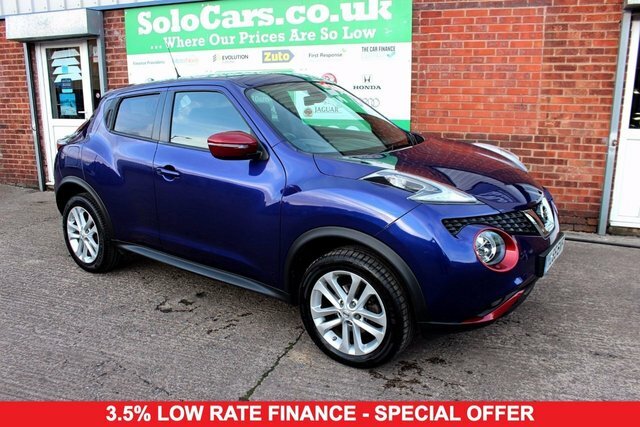 This is A Poper Juke with Keyless Entry/Ignition, Auto Headlights, Auto Window Wipers,, Built in Touch Screen SAT NAV, Reverse Camera, Privacy Glass, 17 inch Alloys, Cruise Control, Climate Control, START/STOP Engine, DAB Bluetooth Stereo with Audio Streaming, USB Connection, Tyre Pressure Monitor System, 6 Speed Gearbox, Adjustable Sports Mode, AC, Both Heated Windscreens & Multi Functional Steering Wheel Controls. If you're looking for a fun city car, a spacious family hatchback, a sporty crossover or a serious off-roader, Nissan is a manufacturer worth serious consideration. The Nissan Micra is a class-leading supermini, while the firm's Juke model set the standard for crossover vehicles. Browse the complete range of used Nissan cars for sale in Liverpool here on our website and let a member of our team help you find a great deal on your next pre-owned vehicle. Here at Solo NW Limited we have a reputation for supplying quality used cars at affordable prices and we ensure that every vehicle is thoroughly tested before going on sale. Start the search for your used Nissan today.